Trim, moulding, and wall panels can transform the look and feel of any room. While simple moulding will give your home a finished look, complex crown designs can create wildly different interior styles. 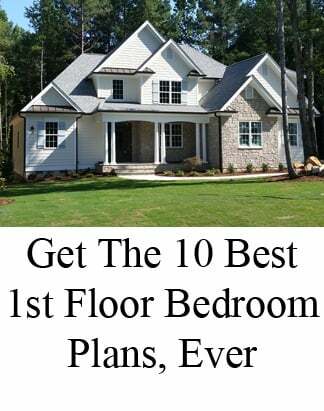 Below is a guide of the most common moulding trim types, to help you see the differences between single piece, multi-piece, and craftsman style moulding (and learn home builder secrets on how to save money on luxury custom home trim designs). Browse the photos below for examples of single piece, multi-piece, craftsman, painted, and light-up crown moulding designs. 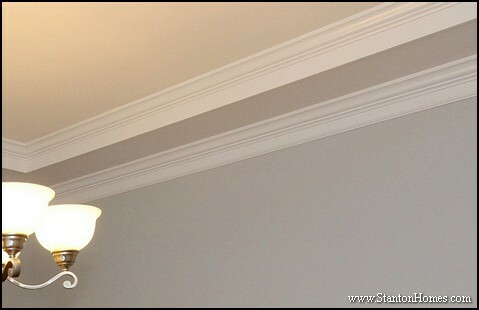 Crown moulding (sometimes spelled "molding") is the decorative trim used to transition from a wall to the ceiling. Multi-piece moulding can also smooth the transition from a window to a wall. 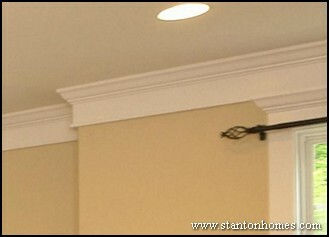 Crown moulding comes in materials that can be painted or stained. Crown moulding usually accents just a few rooms of the home, especially the Formal Dining and the Master Bedroom. Many custom homes also include crown moulding in other living areas. Many homebuyers prefer not to pay the cost of adding crown moulding or specialty trim for secondary bedrooms, bathrooms, laundry rooms, and other less "visible" rooms of the home. What are the Most Popular Types of Crown Moulding? The most popular type of crown moulding found in premium Raleigh custom homes consists of two pieces: an upside down piece of baseboard with a crown piece placed on top. A premium craftsman style crown moulding treatment can use up to 13 individual pieces of trim around window and door wraps. This first example of craftsman moulding shows the detail work above a door. 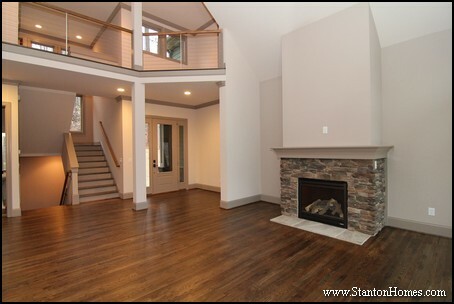 See a photo gallery of this craftsman style home - a version of the Penelope. Here is another example of craftsman style crown moulding - with special details above the doors and windows. This treatment consists of a 1x4 window wrap with casing cap, top casing, fillet, side casing, then stool and apron below the window. This treatment is also a premium window wrap, but is more cost effective than the 13 piece above. The most basic type of crown moulding comes as a single piece, and is usually made of MDF (medium density fiberboard). In custom homes, one piece crown is found more often in trey ceilings, where there is less room for multiple pieces of trim. Although single piece crown costs less to install, it is much less common in Raleigh custom homes, though more common in production homes. Complex crown moulding styles are usually seen only in luxury homes. These styles use more materials and labor - making them more costly to add. Here is a full view of this grand room - from a version of The Remington - to give you an idea of how this trim-and-paint effect can impact the space. 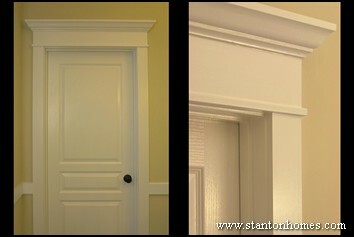 Depending on the feel you wish to achieve, various rooms may use different types of crown moulding, to keep costs down. Dining rooms and formal areas often "break the rules" with trim and paint colors that contrast with the rest of your home. A formal dining room might use a 3-piece crown or one piece crown on various levels of a trey ceiling, while the rest of the home uses a 2-piece crown. Some of the most expensive crown moulding style options include the use of natural Pine, Oak, and Cedar wood. These hardwoods can be stained, with the original wood grain showing through, but the price tag on this once more common treatment can be prohibitive today. Another trim feature located squarely in the luxury custom home market is crown moulding with built in lighting. There are many more types of interior crown moulding - but these are the most popular treatments in the Raleigh custom home market today. 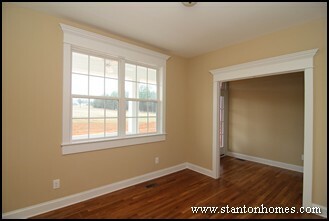 There are dozens of crown moulding styles to choose from when you build a new custom home in the Raleigh, NC area. When you build with Stanton Homes, our interior design team can help you chose the style, color, and size that will best compliment your entire home design. Tell us which crown moulding styles you like best, and we'll show you what it costs to build into your new custom home. 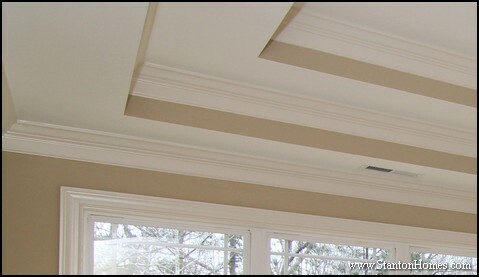 There are dozens of crown molding (moulding) styles to choose from when you build a new custom home in the Raleigh, NC area. Below is a guide of the most common molding trim types, to help you see the differences between single piece, multi-piece, and craftsman style molding. Each of these styles come in a variety of materials. When you build with Stanton Homes, our team can help you chose the style, color, and size that will best fit your home design. 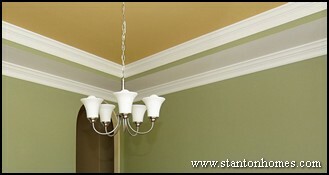 Crown molding is the name for the decorative trim used to transition from a wall to the ceiling. - One piece crown: the most basic type of crown molding comes as a single piece, and is usually made of MDF (medium density fiberboard). One piece crown is used for trey ceiling accents. - Two piece crown: a intricate type of crown molding uses two pieces, one upside down piece of baseboard with a crown piece placed on top. Depending on the look and feel you wish to achieve, various rooms may use different types of crown molding. 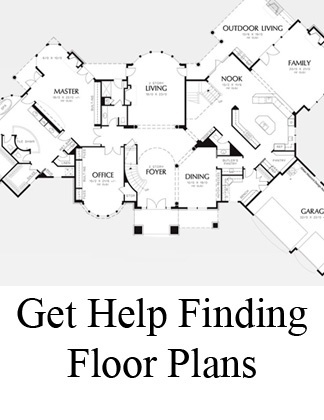 For example, a formal dining room might use a 3-piece crown or one piece crown on various levels of a trey ceiling, while the rest of the home uses a 2-piece crown. - Two piece traditional crown: consists of two pieces of molding, with a painted space in between. 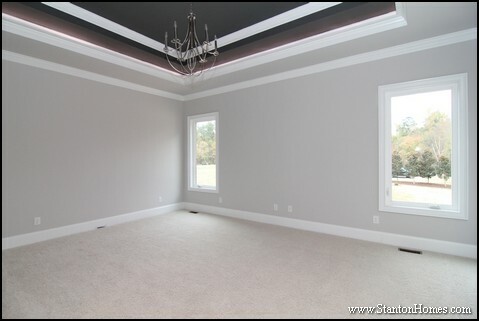 Crown molding usually accents just a few rooms of the home, especially the Formal Dining and the Master Bedroom. 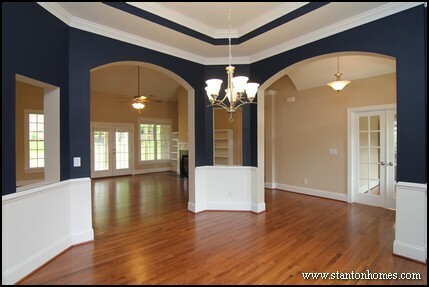 Many custom homes also include crown molding in other living areas. 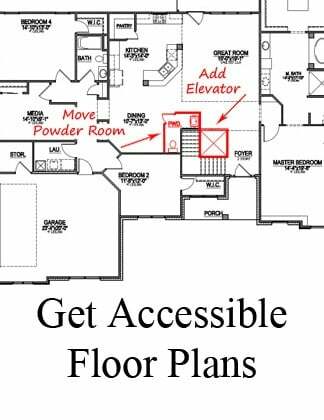 Most home buyers choose to NOT include crown molding or specialty trim in secondary bedrooms, bathrooms, laundry rooms, and other less "visible" rooms of the home. A premium craftsman style crown molding treatment can use up to 13 individual pieces of trim around window and door wraps. This first example of craftsman molding shows the detail work above a door. 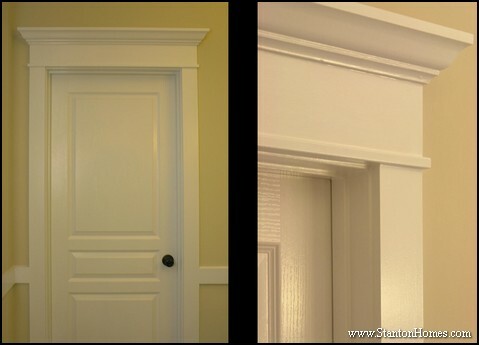 Here is another example of craftsman style crown molding - above a double window and the entrance to a home office. 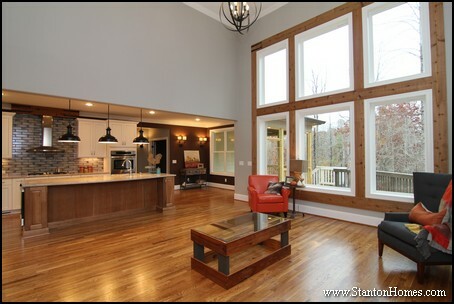 This custom home photo is from a version of the Carwile. 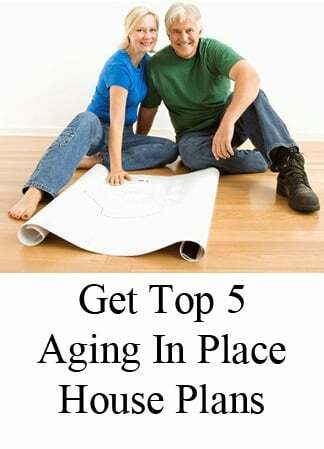 - Three, four, and five piece crown: are usually seen only in luxury homes. These styles use more materials, more labor, and are more costly. 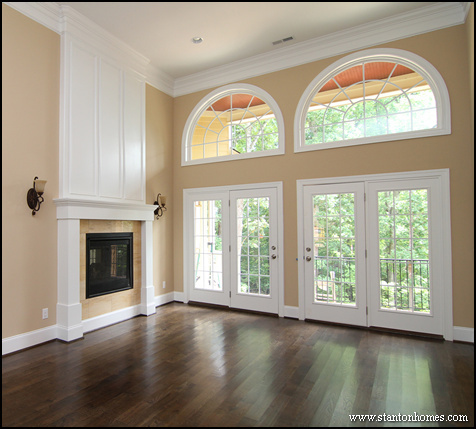 Some of the most expensive crown molding style options include the use of Stain Grade Pine or Oak. Most home buyers choose to paint the crown molding instead. 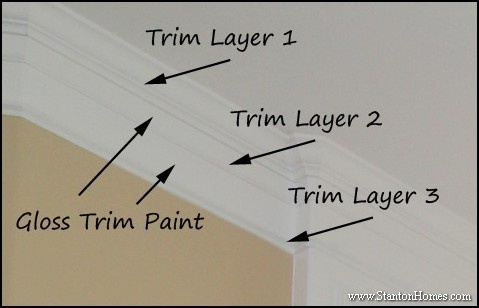 A deep accent trim can be achieved by choosing just the right trim color - crown molding doesn't have to be white! 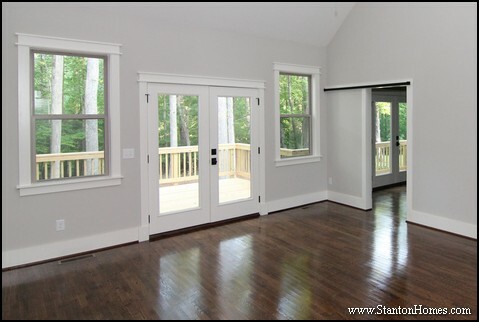 There are many more types of interior crown molding - but these are the most popular treatments in the Raleigh custom home market today.